“Oh, what a night” indeed! 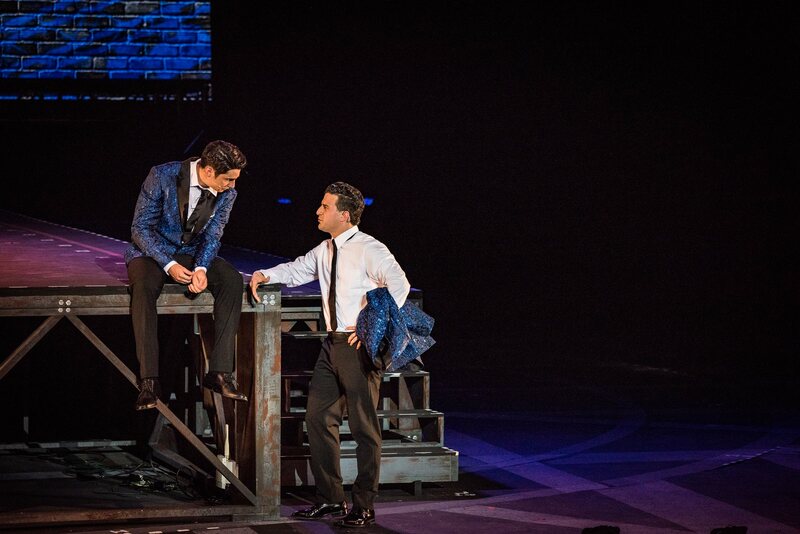 The story of Frankie Valli, and his hit ’60s group The Four Seasons, makes for the perfect musical. Writers Marshall Brickman and Rick Elice have taken the true-story, and crafted a delightful show – full of plenty of laughs and of course numerous hit songs. It’s the kind of show that has you tapping your feet along with the music, and makes it hard not to sing along. The Muny has the honor of producing the show for the first time since Broadway and the national tour – a perfect addition to their centennial celebration. The most important part of Jersey Boys is the voice. That is, the voice of Frankie Valli. 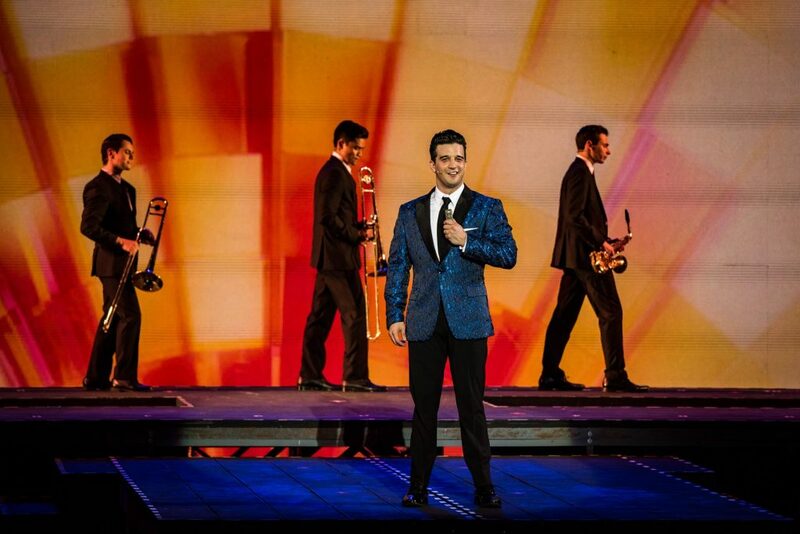 For this production, The Muny has brought in the phenomenally talented Mark Ballas in the lead role. Most widely recognized from his work on Dancing with the Stars (19 seasons), Ballas can do much more than dance. He has an incredible voice, seemingly hitting all of Valli’s high notes with ease. If the actor can’t do that, the show simply doesn’t work. However, this was perfect casting and Ballas was able to light up the stage with his performance. Much of the story is actually told from the perspective of Tommy DeVito, played by Nicolas Dromard. He says in the very beginning, “You ask four guys, you get four different answers.” According to his telling, he was responsible for getting the group together and even getting Frankie into singing in the first place. Along with that, was also getting Frankie into trouble at a young age. Dromard is fantastic in the role – showing a wide range from comedic to the dramatic. As the character gets deeper and deeper into trouble, you always believe he feels like he’s done nothing wrong. The actor nails the role, making it hard not to like the character with his neverending charisma. Keith Hines plays Nick Massi, the quiet bass player who pretty much goes along with whatever Tommy says. His dry delivery and willingness to cave in is exactly what the role calls for, and has a great payoff at the end of the show when he reaches his boiling point. His monologue in act II was met with a thunderous round of applause. Last but certainly not least is Bobby Conte Thornton as Bob Gaudio. Gaudio was famous for his hit song “Short Shorts,” which reached #3 on the charts in 1958. He was somewhat of a “one-hit wonder” until he joined the Four Seasons, and was responsible for the success of their biggest hits (writing songs like “Sherry,” “Big Girls Don’t Cry,” “Walk Like a Man,” and many others). Thornton adds a great energy to the foursome as the wunderkind of the group. His chemistry with Ballas is terrific, as we see Valli and Gaudio form a business partnership that has lasted throughout their careers. Along the way, Frankie and Tommy had plenty of help. Neal Benari plays Gyp DeCarlo, a mobster who can get virtually anything done. Tommy worked for Gyp at a young age, and he grew fond of Frankie’s singing. Benari embodies the character with style, as his character bails out the singers more than once. Nicholas Rodriguez is great as Bob Crewe, Bob Gaudio’s real-life writing partner. He was responsible for giving the four musicians work early on, and recording their first hits. The actor is hilarious in the role, wonderfully capturing the demeanor of the hit record producer. Josh Rhodes directs and choreographs the show. Much of the dancing entails the iconic scenes of The Four Seasons at their microphones, so the show, unfortunately, doesn’t get to utilize Ballas’ dancing abilities to their fullest. However, the numbers involving the ensemble are well done and looked great. There were a few pacing issues that made the energy of the otherwise kinetic show slow down a bit, but nothing that ruined the experience. 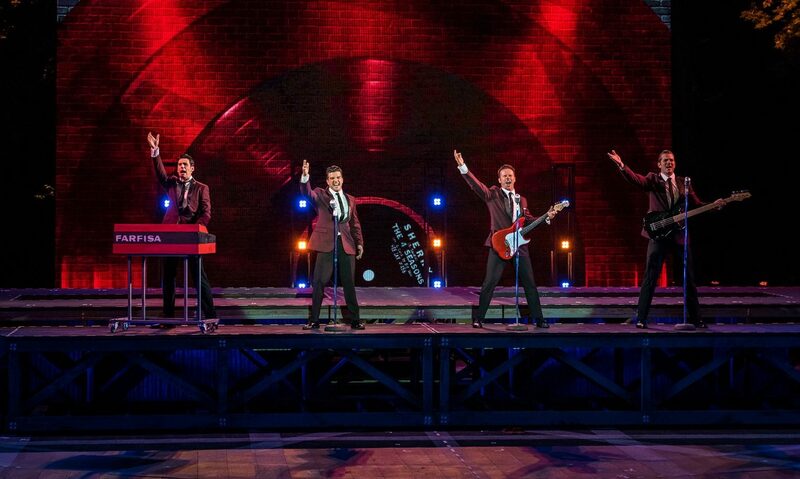 In the end, Jersey Boys is an extremely fun show, and the entire cast is terrific. The costumes were all beautiful, thanks to the work of Andrea Lauer. Everything from the period-appropriate clothing from the ’50s and ’60s, to the iconic red jackets, was picture perfect. Watching the cast in these outfits was a great trip back in time – matched with the classic music, directed by Rick Bertone. There is something in this show for everyone. 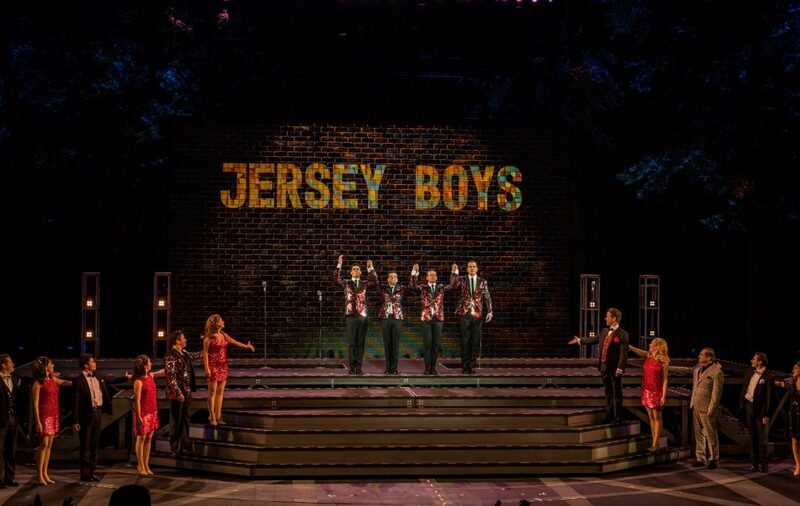 Those who grew up with the music of The Four Seasons will undoubtedly love hearing the group’s hit songs, brilliantly reproduced by the talented singers and musicians. Those who aren’t as familiar with Frankie Valli and the others will still have surely heard some of their numerous hits. The story is fascinating, and the sights and sounds are captivating. It’s a great show, packed with great performances and a lot of heart. 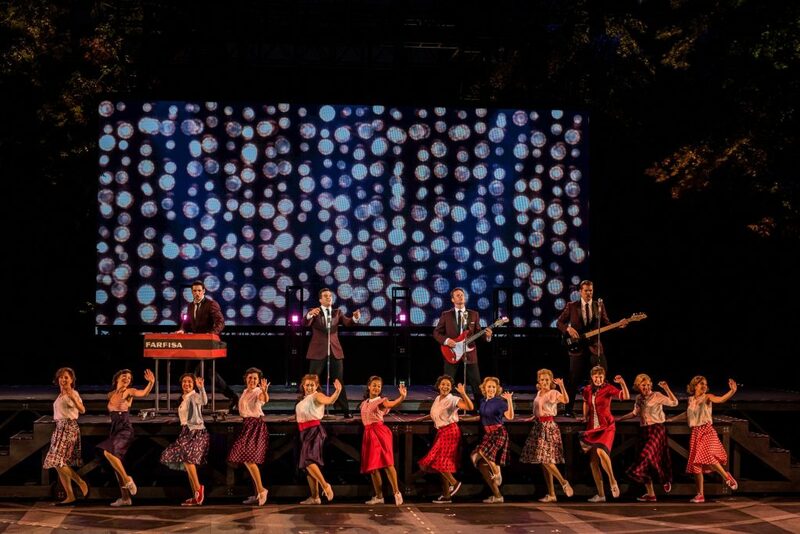 See Jersey Boys at The Muny, now through July 16! Tickets range from $15-$100, and are available through MetroTix. For more information, visit Muny.org.